At the top of the range in 1965 was the B837. This set sold for £24.3.0. (incl pt.). This set is rarely seen nowadays, so the extra £3.3.0 cost as compared to the B831 evidently put most people off, especially as on the face of it the performance may have been perceived to be the same. 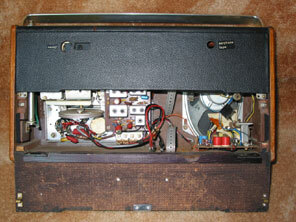 Like the B831, this set includes 9 transistors and 3 germanium diodes, and covers the MW, LW and VHF bands. In common with the other radios here it included bandspread tuning between 187 and 210 metres to enable Radio Luxembourg to be tuned in easily. It is rather bigger than you might guess from the photos too, being some 15" across. The receiver is lent an air of quality by the two wood panels at either end of the cabinet. Transistor line-up AF114, AF115 x 2, AF115 x 2, OC71, OC81D, OC81 x 2. 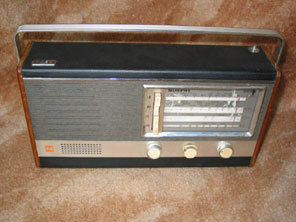 As had been the case with the 1963 range of radios, the 1965 range remained on sale until 1967 when new models were again introduced. No more transistor radios prepared at the moment so time for a quick look at Murphy in Ireland next.